The point-and-shoot digital camera market has become so competitive nowadays that dealers have packaged camera models with freebies. One of the freebies being handed out today include camera carrying cases or bags. 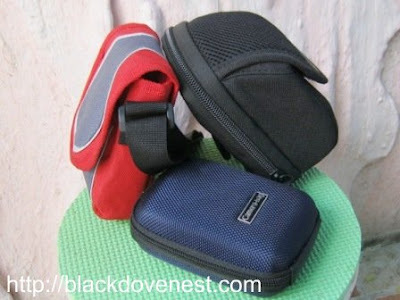 Depending on the camera bag features you're looking for, however, these free camera bags may or may not suit your needs. Here are three camera bags I have and comparing below. Two of them were actually free when I bought the cameras. This is a free camera bag that came with the Canon PowerShot A495 I bought recently. I've seen this camera shoulder bag with the "Canon" brand on it elsewhere on the internet. Surprisingly, this one doesn't have the Canon markings although the colors and design look exactly the same. My impression when I first saw this bag's design and colors was "sporty". I suppose this is the look for the sportsbuff or adventurous tourist. It is well built though. It is made of canvas/nylon fabric with durable stitching. It has pockets in front for a couple of spare rechargeble batteries, and a tiny pocket inside the flap cover for memory cards. 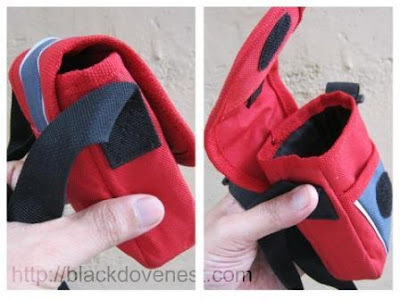 The flap cover is fastened with velcro and is long enough to ensure it covers the bag even if all pockets are filled. The carrying strap for this case is for the shoulder only. It has no belt loop to allow you to wear it at your side. Although the shoulder strap's length is fully adjustable, one end is stitched permanently. That's my main problem with this camera bag because I wanted a camera belt case. Sony gave this original camera bag below when it sold the Sony CyberShot DSC-S40. And yes, it has the Sony markings on the cover flap. It is very well made and has that "professional" look. The bag has two compartments. There's one at the back secured by two heavy duty zippers. 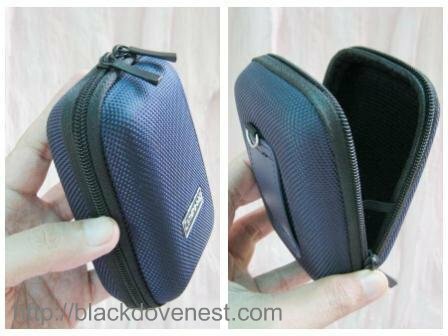 This compartments has pockets so you can insert memory cards. It has space for cables and spare batteries. The front compartment is for the digicam itself. It has foam inserts to protect the digital camera. Although very roomy for the camera and the electronic accessories, the bag is rather humongous for the size of the Sony camera model - a small point-and-shoot digicam. I had a feeling Sony gave this away as a "one-size-fits-all" type of camera bag. 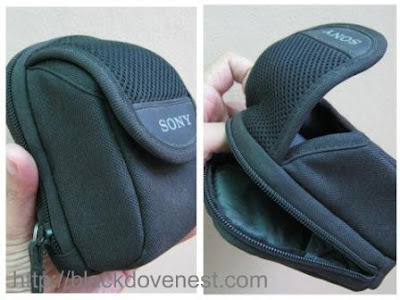 For this reason, I opted to look for a slimmer camera bag for the belt and found a cheap Bodyglove camera belt case for my old Sony camera, now dead. Simply put, I was looking for a cheap camera belt case for the Canon PowerShot A495 model. The freebie bag that came with it was lacking in that it just wouldn't work as a belt case unless I had the shoulder strap stitching removed and a new belt loop added. The sporty color didn't appeal to me either - unless of course I'd go to outings or the beach. The free Sony bag was just too big. Period. After considering the basic digicam bag features I had in mind, I bought the above camera belt case for cheap - Php100 or just less than $3. Sure it had this tacky "Camera Bag" label outside, but I didn't mind. I could just put on an identification sticker to cover it instead. As a clamshell type of camera bag, it's very basic. It has no pockets or extra sleeve so that's as big as it'll get. I don't plan on bringing additional camera accessories in it anyway. I'm assuming the clamshell is made of plastic and a woven nylon fabric covers the bag's body. Incidentally, this fabric comes in a nice shiny blue color that matched my camera model. The photo above shows all three camera bags. You'll immediately note how small the cheap camera belt case is. It's less than half the size of the black Sony camera bag freebie. Easy access to the camera is through two zippers that run around the bag. Don't be fooled by the size though. The camera bag has enough room for the Canon A495 with about 1/4 inch clearance at the sides. That extra room provides easier access to the camera without the unit jiggling inside when you walk.